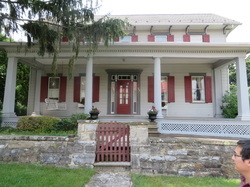 The Academy Street house known to old Boalsburg as The Parsonage, was completed in 1860 on an acre lot bought from Daniel Kimport by the Trustees of the Joint Consistory for the five congregations the forming the Boalsburg Charge of the United church of Christ (formerly German Reformed). Under Articles of Agreement (Sept. 1859) between the Trustees and carpenter-builder George Kline, the house and a stable, pigsty, and privy were ready within ten months at a cost of $1,720.00 (later reported as $2,200). Pastor William H. Groh and his family were the first to occupy the beautiful, well-built large house with a garden, orchard, and grapes to tend as well. Their successors felt the burden increasingly, maintenance and repairs weren’t always adequate, and in 1952 the Joint Consistory of the remaining congregations and sold the property for $12,000 to Mr. and Mrs. Niles Keesler. During their six years of ownership, the Keeslers made extensive renovations returning the Parsonage to its early eminence among village homes. This partly account for the $18,000.00 paid by the Consistory to repurchase it when a small Panorama Village parsonage proved unsatisfactory and construction of a suitable new house would have been prohibitive.